Every time we formally finish a skill, I like to add a new page to the children's Me Books which we are compiling over the course of our year. 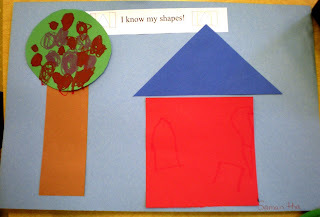 I had never gotten to do that with our shapes, so today was the day to add our "I Know My Shapes" page. This is a very easy page. I have the shapes pre-cut. Then I show the children the shapes and see if they can name them for me. If they have trouble naming them I give the names and see if they can point to the correct shape. Only two had trouble naming. I then have them make a house and tree with the shapes and decorate to their liking. This is a great idea. I posted something similar yesterday. 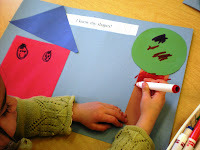 Wow Trish, I am loving all the shape projects! My littlest one (16 month old) is really fascinated with them. She is big on the circles right now, next up is triangles.